At The Press of Robert LoMascolo we recently came across a rather unexpected bit of printing technology. The Barrett Desk Machine is in many ways a typical 1920s mechanical adding machine. The unusual part is that it was manufactured and sold by the Lanston Monotype Company which is best remembered for their type casting machines and the typefaces which were cast on them. After World War I, Lanston Monotype was looking for ways to expand their manufacturing, and it just so happened that the requirements for manufacturing adding machines was not so very different from those already being used to build Monotype keyboards. 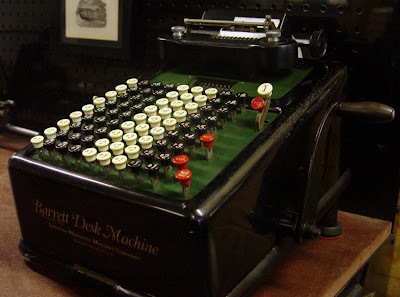 The quality of manufacturing is evident in that with a little cleaning, oil, and a brand new typewriter ribbon, the adding machine is now accurately and consistently crunching numbers just as it was intended to do.